To 'rest', to 'relax' and to 'restore' is essential to everyone especially in today's western society and stressful lifestyle. To 'rest' deeply is to experience absolute relaxation, where there is effortless in stillness, quietness and peace. Restorative yoga is the practice of relaxation for conscious deep rest. A practice with the use of props to support the physical body in position of ease and comfort, to facilitate positive relaxation response, for energetic, emotional and mental equanimity​. As a practitioner, a balanced yoga practice encompasses a spectrum of kinaesthetic asana, the inter-play of active release work, the stillness of restorative and relaxation, and the joy of meditation. Restorative and relaxation may relieve chronic stress and reduce the effects of stress-related diseases, providing an environment for self-repair. The principle is to activate the Parasympathetic nervous system (PNS), which is responsible for balancing life support functions within the body and bringing their response system back to equilibrium. It works to stimulate the baroreceptors, deactivates the sympathetic nervous system, therefore quiets the brain and slows the heart rate. This powerful practice provides conditions for the natural healing process to occur, and brings the body (physical, mental and emotional) to a harmonious relationship with nature. The practice places emphasis on supporting the physical layers allowing space and time for one to renew and heal physiologically. The mental and emotional layers may then unfold and relax within this secure and comforting environment. The activities of the brain / thoughts may settle into quietness and stillness, thus rejuvenating and recharging oneself psychologically, and promoting overall well-being. The practitioner experiences 'conscious' relaxation where one choose to be in a state of stillness, which differs from sleep where one experiences 'reduced or absent consciousness'. 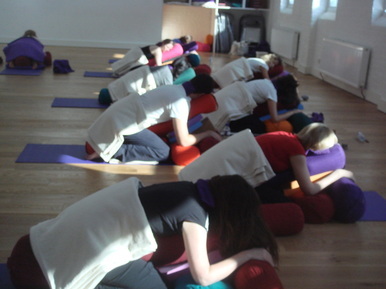 It has been experienced by many that Restorative Yoga balances energetic level. Where one who experiences fatigued / depleted, depressed, low energy or sluggish, the practice has the potential to rejuvenate, restore vibrant energy and lift the spirit, to feel refreshed and ready to move on. Whilst one is experiencing agitation, anger, anxiousness, frustration or an outburst of uncontained energy, this wonderful practice also has the potential to calm, relax and restore the balance. During transitional times or unsettling moments in life, one may practice restorative postures which promotes groundedness and centeredness. My personal account on this practice over time has given me the courage to experience patience, security and compassion for all beings. This is often felt by people around us. Restorative Yoga may be practised by anyone and anytime and almost anywhere (except on busy streets!). Although restorative postures may look simple and peaceful, it can be challenging for 'new relaxers' or times when the mind or the physical body is dis-eased. One may take time to adjust and adapt to doing 'nothing' and be in active rest, so that the mind may settle. The key is patience and willingness to let go... to relax and restore. This is love and time spent with no one, but yourself in stillness. More information and dates on Relax and Restore Immersion / Restorative Yoga Intensive (30 hours). Restorative Yoga Teacher international directory www.restorativeyogateachers.com.